Condition is Used and is sold as is (as seen in photos). AudioSource Amp 300, 2 Channel Multi-Zone 150WPC Amplifier Works Great! The amp works with 12-volt power-on/-off circuitry and also features a signal-sensing circuit for automatic power-on/-off, making it as ideal for custom installers as for end users. Its A and B speaker outputs let you power speakers in your main room, a second room, or both rooms simultaneously. It gives you 250W peak power which can be used for multi speakers w/ 4-8 ohms impedance allowing you to enjoy high quality audio. Audio Source Stereo Receiver System with FM Radio, MP3/USB/SD/AUX Playback (250 Watt)Features. AUDIOSOURCE PREAMPLIFIER/TUNE TWO 2 CHANNEL. GOOD CONDITIONS WORKS AND TESTED. Up for sale is one AudioSource AD1002 Digital Amplifier. Item is a factory refurbished unit in very good conditions. This is a USED amp. It is in full working condition. One of the connectors (pictured) on the back has a bend in it. There are scratches on the unit from age and use. It has a tamper sticker with a serial number on the back. AudioSource AMP100VS. Like new condition and working perfectly. Amp is clean tested and well cared for. FACTORY RECONDITIONED AUDIOSOURCE AMP 5.2 150W MONOBLOCK AMPLIFIER. AUDIOSOURCE AMP 5.2. MONOBLOCK AMPLIFIER. The Amp 5.2 is a fully featured, high current monoblock power amplifier, boasting high quality components housed within heavy-gauge steel. Up for sale is one AUDIOSOURCE AMP310 150 WATT STEREO POWER AMPLIFIER. Item is a manufacturer refurbished in very good conditions. You are looking at an AudioSource AMP210. Because of the high efficiency of its design, the AMP210 produces exceptional sound quality, and clarity in every audible detail. Signal Sensing. Speaker Level Inputs. This unit is in excellent condition both functionally and cosmetically. It is working perfectly and looks great. See photos for details. SS-One/II Dolby Surround Sound Processor with built-in 30 watt per channel amplifier. AudioSource AMP 1200 Amplifier. The versatility of the AMP 1200 makes it the perfect choice for almost every type of custom multi-room audio system. Installer-friendly setup and connections with a tabletop or rackmountable design allow the AMP 1200 to be integrated easily into high-end, whole-house audio systems. See title and pics for description. I am able to plug it in and it powers up. That is the extent of my ability to test. Extremely heavy, therefore shipping is expensive. I am sorry, but voice your concerns to the Post Office. Please budget the shipping into any offer you may make. Power Amplifier is in good condition and is guaranteed. Item has wear from previous use including scuffs and blemishes. Quantity listing with reference photo, you may not receive the actual item pictured. Power cord not included. Item is on hand and ready to ship. Please feel free to message us if you have any questions. Desirable High End AudioSource SS Four Amplified Dolby Surround Processor! Bus 1 and Bus 2 RCA inputs can be assigned to any channel so that different sources are available for each zone. discrete pair of RCA inputs for each zone. flexible power modes include on/off, signal-sensing, and 12-volt trigger. Listening to music all around your house is a lot of fun, and AudioSource makes it easy. 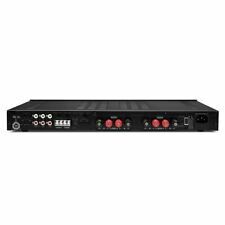 Their rack-mountable AMP1200VS is a high-current, multi-zone amplifier that drives up to six pairs of speakers simultaneously. This has been tested and it is in good working order. Sold as pictured, other accessories not included. AUDIOSOURCE AUDIO-SOURCE AMP200 STEREO POWER AMPLIFIER. Just tested and RCA input one is not working but the RCA input 2 and the speakers inputs are working perfect.